Are you one of those women who crave chocolate before their period is due? You are sure not alone! These cravings are common and often indicate that your body is deficient in magnesium. It happens to me as well. I can get really bad cravings for chocolate and when I do I have to have it. Unfortunately, many times the chocolate I choose is not the healthiest and it’s full of processed sugars. Lately, these chocolate cravings have been happening to me more often and I know it’s because I didn’t pay much attention to my nutrition before my period. I definitely had too many chocolate treats in the last few months which is of course not that healthy but I just couldn’t resist it. I knew my cravings could have got better with supplements but I didn’t want to buy them because they are quite expensive. So I decided to come up with a breakfast recipe which will be packed with magnesium. I would make an effort to have this every day starting about a week before my period is due. People don’t realise it but magnesium is a such an important mineral – it is needed for more than 300 biochemical reactions in the body and it’s important for healthy heart, strong bones, healthy nervous system and normal muscle function. 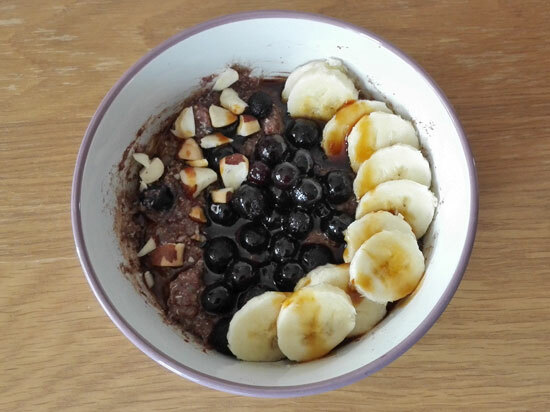 I was really happy how my magnesium-rich porridge turned out. Before I put everything together I did some research to learn about the foods rich in magnesium. I was happy to discover that a medium-size banana provides 32mg of magnesium so this was a must to include. And let’s not forget about raw cacao which is a much better option than the chocolate as it’s unsweetened and unprocessed. 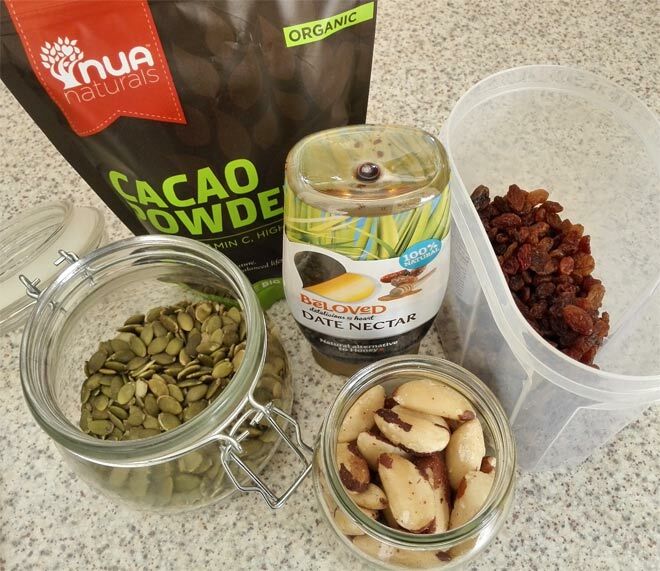 Cacao powder is one of the best sources of magnesium – it contains over 400mg of magnesium per 100g. A two-tablespoon serving contains 54 milligrams of magnesium. So this was also a must to include. Magnesium is also found in nuts, seeds and dried fruits so I decided to go for brazil nuts, raisins and pumpkin seeds. 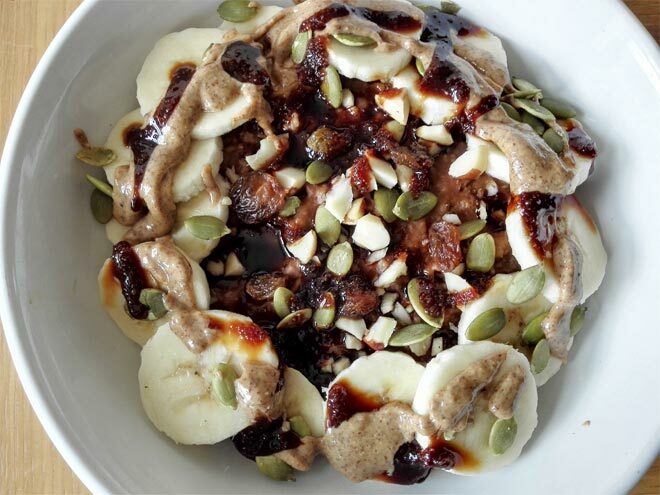 I drizzled my porridge with a date syrup which is another source of magnesium. I also added a spoon of almond butter and the finished porridge tasted amazing. The combination of cacao, banana, raisins and date syrup works so well and then you get this nice crunch from nuts and seeds. I couldn’t have created a better magnesium-rich breakfast. So delicious and much healthier than the chocolate! 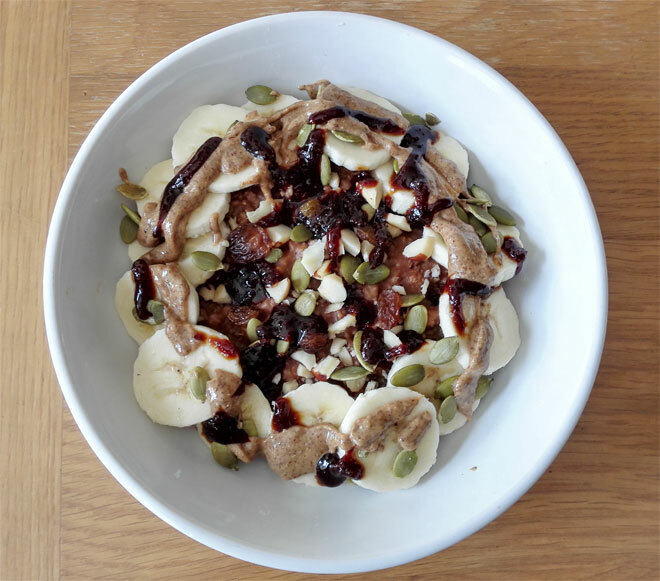 I started having this magnesium-rich porridge about a week before my period and honestly, it really helped with my cravings. Comparing to the previous month, such a big difference! I felt in control of my healthy eating again which made me much happier. I couldn’t recommend this breakfast highly enough to those with chocolate cravings. I normally have about 2 scoops of porridge oats and that’s a really good portion. I am not sure how much that is in grams but looking online a normal portion of porridge oats should be around 50grams. I like to add raisins to porridge before cooking as this softens them and makes them juicier. 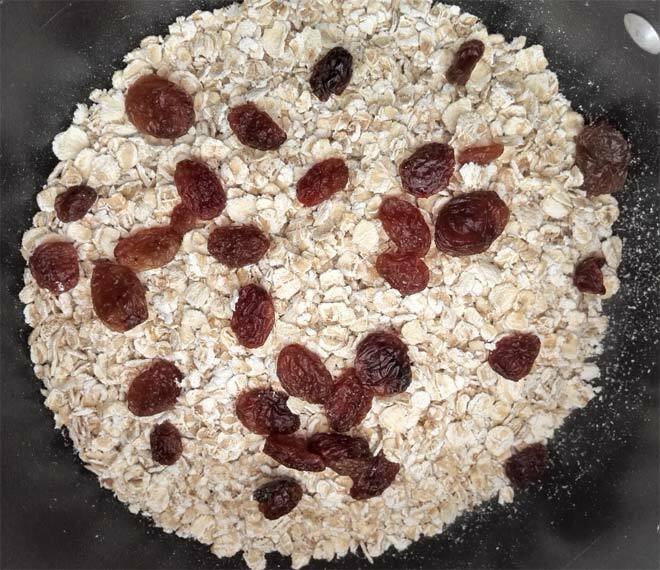 Add oats and raisins together with some water into the small saucepan. Cook the porridge according to the pack instructions. Add more water if needed while it's cooking. The porridge shouldn't take more than 5 minutes to cook. Stir constantly to avoid porridge sticking to the pan. 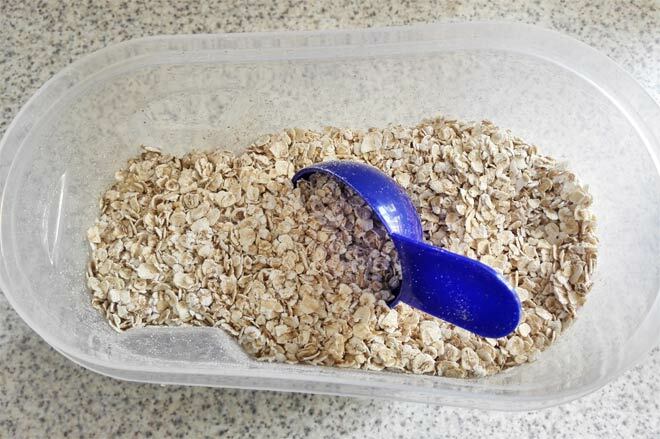 Once the porridge is cooked, add it to a cereal bowl. Add cacao powder and stir well. 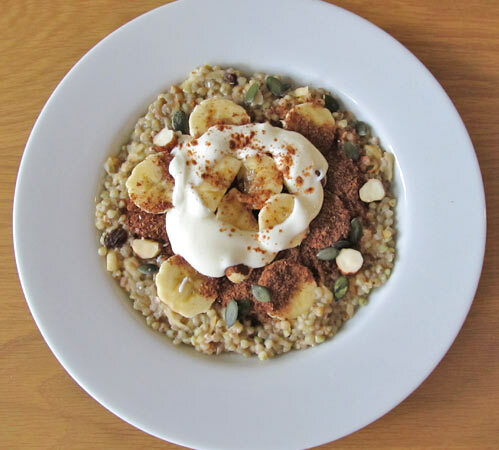 Slice a banana and put it on top of the porridge. Add the rest of the ingredients: chopped brazil nuts, pumpkin seeds, date syrup and almond butter. Use coconut milk such as the one from Koko to improve the flavour. What do you think of this recipe? Will you be giving it a go to try and deal with your chocolate cravings before your period? I am glad to hear you love the recipe, it’s one of my favourite breakfasts! This is a very interesting porridge recipe. And healthy too! Thank you for this as I have been looking for what Magnesium rich food to take. And agree, porridge usually looks like the last picture.